Open Plan Lounge and Kitchen/Diner. The Lounge, features a freeview LCD TV/ DVD player and comfortable suite. The Diner includes a dining table and chairs, whilst the Kitchen offers extensive fittings including a large fridge/freezer, dishwasher, washer/dryer, stove with hob, microwave, kettle, toaster, blender, steamer and every utensil required to create a variety of culinary delights whilst on holiday. A fully fitted Bathroom including bath with shower unit, WC, wash hand basin and heated towel rail. The Bedroom includes a large double bed that can be converted to twin beds if required and provides ample storage space. Its double patio doors provide views of the river source and a delightful wooded area, home to some of the Islands wonderful wild birds. Externally the cottage includes a seating area to the rear. Capturing the evening sun, there is no better place to relax and enjoy a glass of wine after your day’s activities. The Double Garage can be used to store any of the extras that you may have brought to enhance your stay. Cott Pundail is an interesting two storied cottage that could be described as an upside down house. It is finished to a very high standard and has double glazing and central heating throughout. It also has wheelchair access to the ground level and benefits from a private raised garden area accessible from the 1st floor. Ground Floor Bedroom:Consisting of Cottage style furniture, a double bed, bedside cabinets and lights, chest of drawers and a huge wardrobe with additional storage space under the stairs. The ensuite shower room has a large shower unit, hand wash basin, wc, heated towel rail and is fully tiled throughout to an exceptionally high standard. Stairs to open plan Lounge with Kitchen/Diner: Consists of a lovely lounge suite, 37in LCD TV with freeview and a DVD player. The dining room has an oval dining table and chairs and the kitchen is fully equipped with utensils, pots and pans for any range of cooking, toaster, microwave and even a steamer. Fridge, dishwasher, washer and dryer finishes off this holiday essentials list to make your holiday a relaxing one. Access to the garden is through double patio doors to the raised area with fantastic sea views over Laxey Bay and there is outdoor table and chairs to enjoy the superb views with a glass of wine of two. 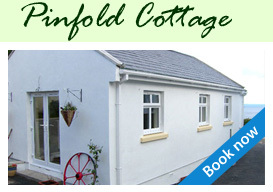 The cottage also has ample off road parking and garage space available by prior arrangement. 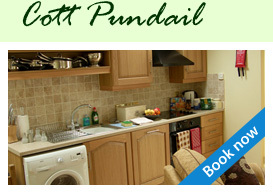 All linen, towels, heating and electricity is included in the tariff. 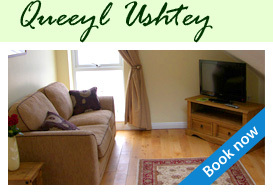 Queeyl Ushtey (Water Wheel) is a delightful apartment with double glazing and central heating throughout. The apartment is accessed by stairs to the rear of the property adjacent to the Water Wheel therefore unsuitable for wheelchair access. It has been finished to an exceptionally high standard and has superb sea views over Laxey Bay. Bedroom: Double bed with built in wardrobe, bedside cabinets and lights and a chest of drawers. Capturing the sun rise from this room with sea views is the perfect way to awake on your holiday. Open plan Lounge with Kitchen/Diner: The lounge is fitted with a 32in LCD TV, freeview and DVD intergrated. Comfortable lounge suite to relax during your stay. The Dining area has dining table and chairs and the fully fitted and equipped Kitchen offers fridge, freezer, washing machine, dryer, oven and hob, microwave, kettle, toaster and a steamer. Utensils, pots and pans all included to compliment your eating experience. Bathroom: Bath with built in shower, wc, hand wash basin and storage facility.